It's the first week of November and that can only mean one thing. No, not Bonfire Night – Christmas. That's right, the Halloween decorations have barely even come down and we are already talking about the festive period. Fairy lights adorn high streets, the newest children’s toys fill up shop windows and festive sandwich flavours pop up in supermarkets. And, most importantly, we are now in the middle of what is becoming a major part of the yuletide calendar – the battle to become the number one Christmas ad, in what many are calling the British Super Bowl of advertising. What ad will be the talk of living rooms across the country this year? And today how will John Lewis come up with anything better than a penguin on a trampoline? Let’s face it John Lewis is going to be hard to beat. Almost half of the top ten most shared global Christmas ads of all time come from the UK retail store and the release of the John Lewis ad is becoming as much a part of the Christmas story as mangers, shepherds and frankincense. But last year we saw more and more brands upping their game to join the Christmas party. In the UK, Sainsbury’s controversial "Christmas is for sharing" by Abbot Mead Vickers/BBDO came close to taking the top spot, only for John Lewis to finish top of the pile once again. This year we have already seen some good spots from the likes of Mulberry, Burberry and Lidl. But how do you create a fantastic festive ad? How do you make sure your ad is a creative Christmas cracker and not an undercooked turkey? Well the busy elves at video ad tech company Unruly have compiled a handy guide to keeping your brand’s online video on Santa’s "nice list" this festive season. Emotional engagement is vital for viral video campaigns throughout the year, but particularly at Christmas when consumers are thinking with their hearts rather than their heads. After all videos that elicit strong emotional responses are twice as likely to be shared than those that elicit weak emotional responses. Previous Christmas campaigns are a perfect case study for this theory. While highly emotional work from John Lewis and Sainsbury’s regularly breaks online sharing records, ads that focus on saving consumers money fail to set the web alight. When you think of Christmas, which emotions do you think of? The happiness and warmth of the festive season? Of course. Surprise and excitement at opening presents and seeing loved ones? Sure. Nostalgia for all those Christmases you had a when you were a child? Definitely. 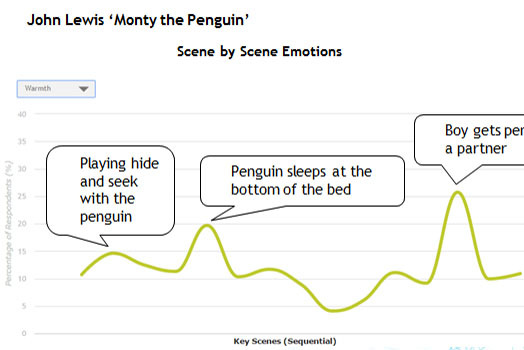 When we tested John Lewis’s Christmas number one, "Monty the penguin" by Adam & Eve/DDB, we found the ad ranked extremely highly for all these emotions. Warmth, in particular, driven in the ad by the relationship between the boy and his penguin, was a key emotion. So, by consistently tapping into the key emotions of Christmas, the feelings that are the most likely to resonate around that time of the year, John Lewis has managed to create a template for social video success. Remember, an ad’s success is about emotional appeal, not creative appeal. One of the biggest mistakes brands make when they are launching a video online is to think that good content will somehow rise to the surface no matter what. That people will find it and share it. It doesn’t work like that. There’s so much content in our social feeds these days, it’s harder than ever to stand out from the crowd. This is why it’s more important than ever before for brands to have a smart distribution strategy in place to make sure people are seeing their content. Your distribution strategy is just as important as your content strategy. In fact, academic Dr Karen Nelson-Field, author of Viral Marketing: The Science of Sharing, recently suggested that when it comes to online video advertising "distribution is king and content is queen". Research has found there’s no relationship between how much sharing a video attracts and the level of branding it has. Nor does overt branding make a video less emotionally impactful. So don’t waste your budget pushing content out that no one knows you did, or even worse, viewers think your competitors did. The stars were certainly out last Christmas, with celebs including Lady Gaga, Tony Bennett, Ant and Dec, Romeo Beckham and even The Minions all appearing in festive ads. However, how many do you think made it into the top ten in 2014? Well, just two - a global ad featuring The Minions, which finished first (but I’m not entirely sure they count as celebs), and Romeo Beckham’s ad for Burberry, which was seventh overall. In fact, a lot of the most popular Christmas ads last year featured just ordinary people, such as Tesco’s "Wigan light show" by Wieden & Kennedy London. It was the same story the year before. The highest placed star-studded commercial was for M&S, which finished eleventh overall in 2013, while, just like 2014, 2013’s high-climbers celebrated the average Joe or Jane, such as WestJet’s "Christmas miracle", Sainsbury’s "homecoming" and Tesco’s nostalgic commercial "there’s nothing better than Christmas". Do retailers really need a glossy TV ad for Christmas?